Arriving in Dieppe in "Haute Normandie" (the northern part of Normandy), I headed down the coast and thought about the events that had taken place here some thirty years earlier. I met an elderly cyclist gentleman near the famous Omaha Beach. I had stopped in front of an old farmhouse, just a few hundred meters from the beach, when a seventy-year-old man on an equally ancient bicycle, came pedaling leisurely home from the boulangerie with one of the ubiquitous sticks of French bread sticking out from a basket strapped to the back of the bicycle. He turned off the road towards the farm house and stopped to greet me. 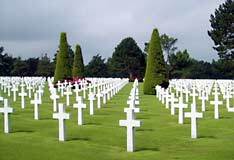 He was downright delighted to learn that I was an American, come to see the famous invasion site. We spoke of the war and that day when, as he explained, he and his family had been awakened by the sounds of Allied bombs shelling the beach in preparation for the invasion. He pointed to the spot not far from the farmhouse where he and his wife had first spotted the Allied ships coming over the horizon, even as bombs were landing dangerously close to them. I asked him if he hadn't been terribly afraid to be so close to ground zero during the invasion. He admitted that he had been afraid, standing outside, while the bombs fell close by. His fear was overridden, he explained, by the exhilarating prospect of finally being rid of the Nazis! In fact, "we were jumping for joy," he told me. "There are things in this life worse than death. Being enslaved is one of them." A few miles farther down the coast I had another unforgettable encounter. I had just left for a morning visit to the famous Mont-St.-Michel  the most recognized tourist site in all of France after the Eiffel Tower  and was headed towards St. Malo where I hoped to spend the night at a youth hostel, as the weather was threatening. 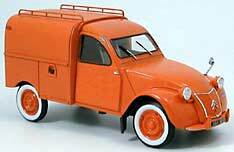 While pedaling along on a small winding road, I caught up to a distinctive orange fourgonnette (mini panel truck) of the French Highway Department. The truck was riding slowly as there was a man leaning from the open back door picking up some marker cones from the middle of the road, where the lines had just been painted. I grabbed the back of the truck and struck up a conversation with the affable highway worker in the back. After preliminary introductions during which I met three other highway workers  Lucien, Jean-Claude, Serge, and Yves  we took our places sitting on small stools in the back of the panel truck. In honor of the visit of an American guest, the foreman and oldest of the four broke out a bottle of chilled white wine which was kept in the van in a bucket of melting ice. I found it strange that they should go to the trouble of keeping a chilled bottle of wine for an ordinary meal, as they surely weren't expecting guests? It was a revealing insight into the gastronomical priorities of even simple French highway workers. It would be the aperitif , they told me, along with peanuts and crackers we nibbled on while awaiting the first course of salad which one of the colleagues was preparing. The rest of us listened attentively to the war stories of the older man whose name was Lucien. He was 55, which would have made him about nineteen in 1944, my dad's age. The other fellows were all about ten years younger. We were spell-bound while Lucien entertained us with tales of that fateful day in 1944, as Jean-Claude and Serge prepared what was shaping up to be a four-course meal. "À table" Serge finally called, announcing that the meal was ready, a half-hour since we'd taken the first sip of the aperitif. Meanwhile, my head was somewhat spinning from the numerous toasts of white wine we'd drunk to the U.S. army for their noble efforts. 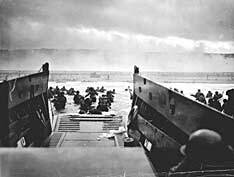 I informed my hosts how my dad had been part of the Allied effort, having come over in July '44 and serving as an interpreter for the American army. Meanwhile, J-Claude opened another bottle of white wine to accompany the salade lyonnaise which, in addition to lettuce, tomatoes, and endives, contained bits of hard-boiled eggs, and bacon in a mustard vinaigrette. It was delicious.